What Are the Side Effects of Drinking Tea? It's always a good time for a cup of tea. In the morning, black tea can provide the boost of energy you need to start your day, while in the evening, herbal tea can serve as a relaxing drink before bed. Depending on how much tea you drink and its specific type, however, tea has the potential to lead to some unpleasant side effects. When thinking about the side effects of tea, consider the drink's caffeine content. According to MedlinePlus, a cup of tea can often have between 14 and 60 milligrams of caffeine, which is less than the caffeine found in coffee. However, it could provide a noticeable jolt of energy for some people. Although caffeine affects people differently, too much tea can lead to anxiety, restlessness and difficulty sleeping. If you make caffeinated tea a part of your daily routine and eventually find yourself needing a cup or two to get through your day, you've likely developed a dependence on the stimulant. Upon lowering your caffeine intake or stopping altogether, it's possible that you might experience withdrawal symptoms, including trouble concentrating, headaches and excessive fatigue. The side effects of caffeine withdrawal are serious enough that Johns Hopkins Medicine considers the issue a mental disorder. Caffeine can have a mild diuretic effect, but typically only if you have 5 to 8 cups of tea after you haven't had tea for a long period of time. In general, tea isn't a diuretic if you drink it moderately. Although you might know to skip the caffeinated tea before bed in favor of a type of tea that doesn't contain caffeine, the fluid intake before bed might cause you to have to urinate during the night. Although this side effect of the beverage is mild, it could lead to sleep disruptions and subsequent fatigue. Drinking too much tea may lead to skeletal fluorosis, a painful condition in your bones, according to "The New England Journal of Medicine." A 2013 article in the journal cited the case of a woman with this condition who drank excessive amounts of black tea for nearly two decades. Black tea contains fluoride, which has the potential of harming your bones if you consume it in large amounts for a lengthy period of time. Moderate tea consumption, however, has minimal risk. According to the University of Maryland Medical Center, drinking green tea might increase your risk of colorectal cancer, lung cancer and esophageal cancer. UMMC stresses, however, that more studies are necessary before the links between these illnesses and green tea can be substantiated. 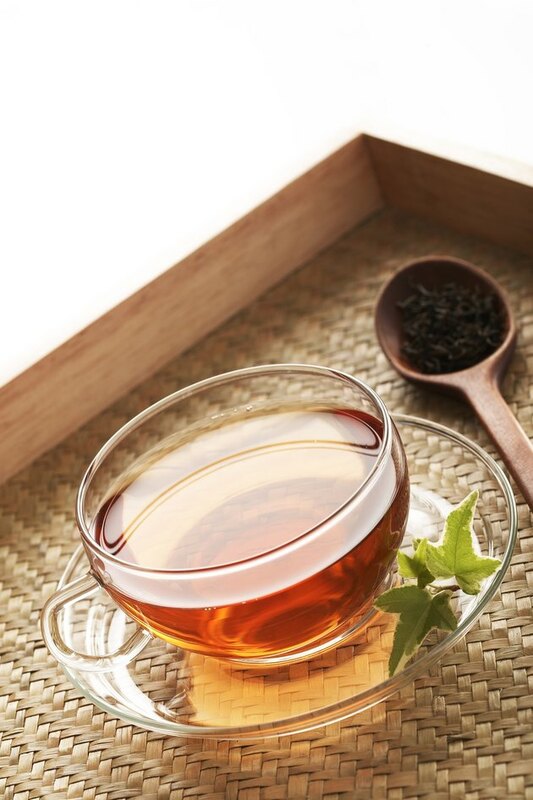 Additionally, green tea might cause complications among those with anxiety, high blood pressure and stomach ulcers.